As the comic attempts to show, New Super Mario Bros. Wii ranked first out of all Wii games sold in November. The NPD just released their sales numbers for November, and Nintendo had nine games in the "Top 20". 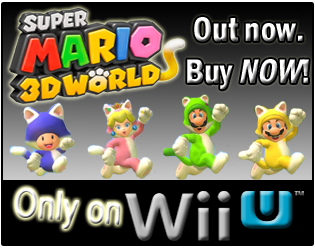 New Super Mario Bros. Wii, which sold 1.39 Million copies. Wii Sports Resort, which sold 720.2K copies. 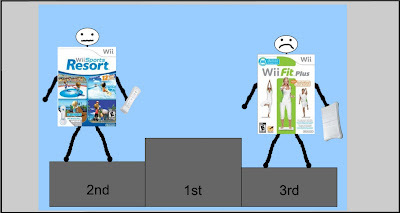 Wii Fit Plus, which sold 679.0K copies. 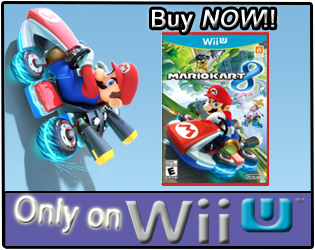 Mario Kart Wii w/ Wheel, which sold 315.0K copies. Mario & Sonic at the Olympic Winter Games. The Nintendo DS had one title make the NPD "Top 20", and that title was Mario & Luigi: Bowser's Inside Story. The odd game listing in the NPD "Top 20" was the "value game bundle" on the Wii, which appeared twice on the list. The NPD hasn't provided any further data on the "value game bundle", so unless they do, there is just speculation as to what games those may have been. Out of the eight Wii games in the November "Top 20", the only one that was actually released in November, was New Super Mario Bros. Wii which was released on November 15. Wii Sports Resort was released in July of this year, and has 157,400 players reporting data so far. 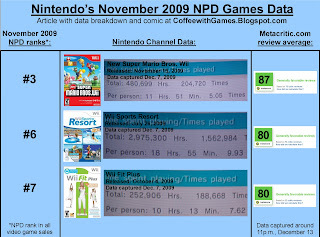 Wii Sports Resort was ranked 6th overall in the NPD "Top 20". Wii Fit Plus was released in October, and has 24,759 players reporting data. 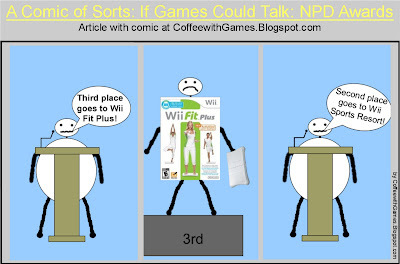 Wii Fit Plus was ranked 7th in the NPD "Top 20". New Super Mario Bros. Wii was just released last month, on November 15, and already has 40,538 players reporting data on the Nintendo Channel. New Super Mario Bros. Wii was ranked 3rd in the NPD "Top 20", behind Call of Duty: Modern Warfare 2 on the Xbox 360 and PS3. Mario Kart Wii was released in April of 2008 and since then has had 1,332,046 players report play-time data on the Nintendo Channel. Mario Kart Wii was ranked 10th in the NPD "Top 20". Wii Play was released on February 12, 2007 and has had 1,660,939 players report their play-time data since it released. Wii Play was ranked 11th in the NPD "Top 20". Mario & Sonic at the Olympic Winter Games was just released in October, and has 9,920 players reporting data on the Nintendo Channel...maybe more people are waiting for the Olympic Winter Games ti start before they buy this game and actually play it? Mario & Sonic at the Olympic Winter games was ranked 12th in the NPD "Top 20". As the pictures show, New Super Mario Bros. Wii is currently the highest rated game out of these, sitting at 87% out of 100%. Wii Play, the game that has sold the most of all games this console generation, is sitting at the lowest review score average, 58% out of 100%. I think I would rather pay $50 for Wii Play, and get an extra controller that actually functions, than to pay $120 for Tony Hawk: RIDE and a controller(board) that doesn't seem to function well at all. Of the other games, Wii Fit Plus and Wii Sports Resort both average 80% out of 100% and Mario Kart Wii is at 82% out of 100%. I do find it interesting, that out of the "main" games, Mario & Sonic at the Olympic Winter Games has the lowest average review score and also has the lowest reported play-times. I think it's pretty crazy how well some of these games are still selling, and how poorly some other games are selling(games like Uncharted 2 on the PS3 falling off after one month!). Out of the six Wii games shown here, I actually don't own any of them(and I don't know what the "value game bundle" consisted of). I also don't own Mario & Luigi: Bowser's Inside Story. Do you own any of these games? If so, did you purchase them recently, or did you get them right after they were released? 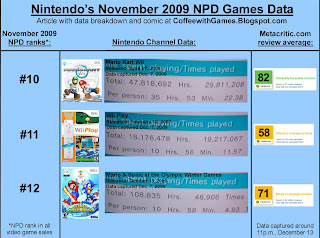 I own a good number of the Nintendo games on November 2009's NPD data. I bought New Super Mario Bros. Wii, Mario Kart Wii, and Wii Sports Resort all on launch day or very soon after. And finally I bought Wii Play a little after I got my Wii (for the extra remote), which wasn't anywhere near it's release. And I don't own Wii Fit Plus or Mario & Sonic at the Olympic Winter Games. So as far as me buying games, I tend to stick to the traditional approach of buying them on day one or close to it (or even pre-ordering them). I haven't purchased a DS game in more than a year, and I don't play my DS often. I've heard many good things about Mario & Luigi: Bowser's Inside Story though.